The Greenworks G40LT is a convenient, eco-friendly and straightforward way to keep your garden in trim without the restraints of a power cord. The Greenworks G40LT 40V front mount string trimmer offers petrol-like performance without the ignition problems, unpleasant exhaust emissions and time-consuming maintenance. The straight shaft, loop-handled grass trimmer has a generous 30cm twin line cutter head which ensures you get the job done swiftly and with the minimum hassle. The Cutting width can be adjusted from 25cm to 30cm by easily altering the line cutting blade. The cutter head is equipped with 1.6mm diameter line and features a variable speed trigger for control around more delicate areas of the garden. Storage and transportation of the Greenworks G40LT grass trimmer is made easy thanks to the split shaft. 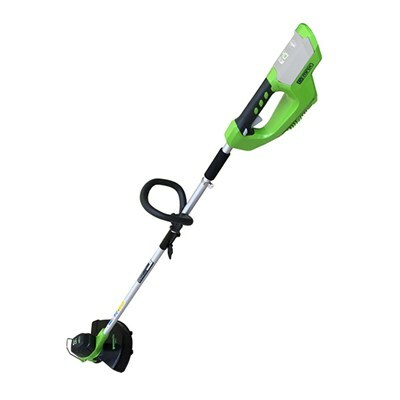 Part of the Greenworks G-MAX 40V system, where one battery fits over 10and garden tools which includes lawnmowers, blowers, hedge trimmers, tree pruners and chainsaws. It is not to be used by children or persons not wearing adequate PPE or clothing. Eye protection must be used when operating this machine.